This authentic and scrumptious chicken recipe can be a highlight of your weekend food party. It's a spicy version though you can easily make a lighter version with a moderate amount of chili. Take a big and nice chicken to get the best results. Making spatchcock poultry is an art and can be easily learned. All you need is a clean sharp knife and the methodology to do the same. Use wood or coal-based open grill to get the authentic flavor of this delicious recipe. Always serve it with sharply flavored salad, a spicy dip, and your favorite bread. Leftovers of his recipe can be reused in a topping or in a sandwich. Let's make this irresistible and lip smacking chicken recipe for our family members. 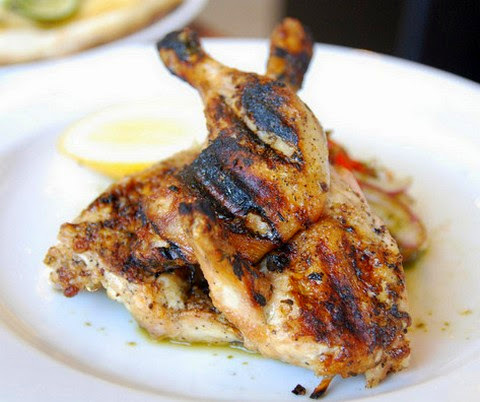 Do make this fiery and delicious chicken preparation which is grilled on wood fire grill and is seasoned with hot peppers and spices for a lip-smacking flavor. Take a large bowl and add generous amount of extra virgin olive oil in it. Add chili flakes, ground pepper, garlic powder, onion powder, lime juice and salt in it. Whip it for about two minutes to mix everything well. Make deep cuts in the chicken with a sharp knife. Pour the seasoned marinade over the chicken and apply it well with your hands. Keep the marinated chicken aside for 15 minutes. Meanwhile prepare the open grill with wood based coal. Place the grill bar on top and place the spatchcocked chicken on top of it. Grill it well till the chicken is cooked well from all the sides. Serve hot with your favorite sauce and bread.